Maxim Logistics were chosen finalist in Team of the Year and SME Company of the Year in this year’s Northamptonshire Logistics Awards. It was an excellent night and a great opportunity to celebrate the success of our teams and the hard work they do in supplying product to the food manufacturer’s day in day out. 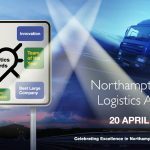 Organised by the Northamptonshire Logistics Forum – a forum facilitated by Northamptonshire Growth Hub and made up of over 115 logistics companies county-wide – this year’s ceremony includes nine categories and a selection of individual and team awards. The judging panel comprised of senior representatives from leading logistics companies as well as the awards headline sponsor MHA MacIntyre Hudson and all category sponsors.